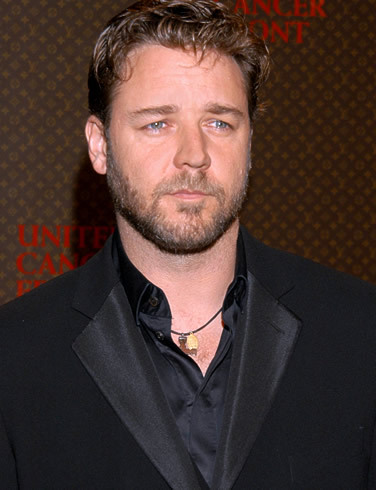 Russell Ira Crowe is a New Zealander Australian actor, film producer and musician. He came to international attention for his role as Roman General Maximus Decimus Meridius in the 2000 historical epic film Gladiator, directed by Ridley Scott, for which he won an Academy Award for Best Actor, a Broadcast Film Critics Association Award for Best Actor, an Empire Award for Best Actor and a London Film Critics Circle Award for Best Actor and ten further nominations for Best Actor. Crowe appeared as the tobacco firm whistle blower Jeffrey Wigand in 1999 film The Insider, for which he received five awards as Best Actor and seven nominations in the same category. In 2001, Crowe's portrayal of mathematician and nobel prize winner John F. Nash in the biopic A Beautiful Mind brought him numerous awards, including an BAFTA Award for Best Actor in a Leading Role, a Golden Globe Award for Best Actor category Motion Picture Drama and a Screen Actors Guild Award for Outstanding Performance by a Male Actor in a Leading Role. Crowe's other films include L.A. Confidential , Master and Commander: The Far Side of the World Cinderella Man , American Gangster , 3:10 to Yuma and Robin Hood . Crowe's work has earned him several accolades, including a Star on the Hollywood Walk of Fame, three Academy Award nominations in a row (1999–2001), one Golden Globe Award for Best Actor, one BAFTA, and an Academy Award. Due to his success and character variety, critics have often called him a "virtuoso" actor. He is also co-owner of South Sydney Rabbitohs, an Australian National Rugby League team. Crowe was born on 7 April 1964 in Wellington, New Zealand, the son of Jocelyn Yvonne (née Wemyss) and John Alexander Crowe, both of whom were movie set caterers; his father also managed a hotel. Crowe's maternal grandfather, Stan Wemyss, was a cinematographer who was named an MBE for filming footage of World War II. Crowe's maternal great-great-grandmother was Māori, and his paternal grandfather was from Wrexham, Wales; Crowe also has Scottish, Norwegian, English, and German ancestry. His cousins, Martin and Jeff Crowe, are former New Zealand cricket captains. When Crowe was four years old, his family moved to Australia, where his parents pursued a career in film set catering. The producer of the Australian TV series Spyforce was his mother's godfather, and Crowe at age five or six was hired for a line of dialogue in one episode, opposite series star Jack Thompson (in 1994 Thompson played Crowe's father in The Sum of Us). Crowe also appeared briefly in serial The Young Doctors. He was educated at the Sydney Boys High School. When he was fourteen, Crowe's family moved back to New Zealand, where he attended Auckland Grammar School with cousins Martin Crowe and Jeff Crowe. He then continued his secondary education at Mount Roskill Grammar School, which he left at the age sixteen to pursue his ambitions and childhood dreams of becoming a successful actor. Crowe began his performing career as a musician in the mid-1980s, under guidance from his good friend Tom Sharplin, when he performed as a rock 'n roll revivalist, under the stage name Russ Le Roq. He had a New Zealand single with I Just Want To Be Like Marlon Brando. He managed an Auckland music venue called "The Venue" in the mid '80s. Crowe returned to Australia at age 21, intending to apply to the National Institute of Dramatic Art. "I was working in a theatre show, and talked to a guy who was then the head of technical support at NIDA," Crowe has recalled. "I asked him what he thought about me spending three years at NIDA. He told me it'd be a waste of time. He said, 'You already do the things you go there to learn, and you've been doing it for most of your life, so there's nothing to teach you but bad habits.'" From 1986 to 1988, he was given his first professional role by director Daniel Abineri, in a production of The Rocky Horror Show. He played the role of Eddie/Dr Scott. He repeated this performance in a further Australian production of the show. In 1987, Crowe spent six months busking when he could not find other work. In the 1988 Australian production of Blood Brothers, Crowe played the role of Mickey. He was also cast again by Daniel Abineri in the role of Johnny, in the stage musical Bad Boy Johnny and the Prophets of Doom in 1989. After appearing in the TV series Neighbours and Living with the Law, Crowe was cast in his first film, The Crossing , a small-town love triangle directed by George Ogilvie. Before production started, a film-student protégé of Ogilvie, Steve Wallace, hired Crowe for the film Blood Oath , which was released a month earlier than The Crossing, although actually filmed later. In 1992, Crowe starred in the first episode of the second series of Police Rescue. Also in 1992, Crowe starred in Romper Stomper, an Australian film which followed the exploits and downfall of a racist skinhead group in blue-collar suburban Melbourne, directed by Geoffrey Wright. For the role, Crowe won an Australian Film Institute award for Best Actor, following up from his Best Supporting Actor award for Proof in 1991. After initial success in Australia, Crowe began acting in American films. He co-starred with Denzel Washington in Virtuosity and with Sharon Stone in The Quick and the Dead in 1995. He went on to become a three-time Oscar nominee, winning the Academy Award as Best Actor in 2001 for Gladiator. Crowe was awarded the Centenary Medal in 2001 for "service to Australian society and Australian film production." Crowe received three consecutive best actor Oscar nominations, for The Insider, Gladiator and A Beautiful Mind. Crowe won the best actor award for A Beautiful Mind at the 2002 BAFTA award ceremony, as well as the Golden Globe and Screen Actors Guild Award for the same performance. However, he failed to win the Oscar that year, losing to Denzel Washington. It has been suggested by the Guardian and Entertainment Weekly that his attack on television producer Malcolm Gerrie for cutting short his acceptance speech may have turned voters against him. All three films were also nominated for best picture, and both Gladiator and A Beautiful Mind won the award. Within the six year stretch from 1997–2003, he also starred in two other best picture nominees, L.A. Confidential and Master and Commander: The Far Side of the World. In 2005, he re-teamed with A Beautiful Mind director Ron Howard for Cinderella Man. In 2006 he re-teamed with Gladiator director Ridley Scott for A Good Year, the first of two consecutive collaborations (the second being American Gangster co-starring again with Denzel Washington, released in late 2007). While the light romantic comedy of A Good Year was not greatly received, Crowe seemed pleased with the film, telling STV in an interview that he thought it would be enjoyed by fans of his other films. In recent years, Crowe's box office standing has declined. The Hollywood stock market share Russell Crowe , issued in 1997, however maintains constant accretion. Crowe appeared in Robin Hood, a film based on the Robin Hood legend, directed by Ridley Scott and released on 14 May 2010. Crowe starred in the 2010 Paul Haggis film The Next Three Days, an adaptation of the 2008 French film Pour Elle. it was something to do with some recording picked up by a French policewoman, I think, in either Libya or Algiers...it was about taking iconographic Americans out of the picture as a sort of cultural destabilisation plan. Crowe was guarded by United States Secret Service agents for the next few months, both while shooting films and at award ceremonies. Scotland Yard also guarded Crowe while he was promoting Proof of Life in London in February 2001. From his youth to the present, Crowe has had a special love of horses. "They're just like people," he told CraveOnline, "there are some horses that you have a deeper connection with immediately, and you can work on that over time." He has also noted that he sometimes finds it difficult to part with his equine co-stars when a film wraps. Most of the year, Crowe resides in Australia. He has an apartment in Sydney at the end of the Finger Wharf in Woolloomooloo and a rural property in Nana Glen near Coffs Harbour, New South Wales. In 2011 the family moved to a house with a garden in Sydney´s Rose Bay. The Nana Glen property, a cattle farm , includes a chapel that Crowe built for his wedding to Spencer. Crowe also owns a house in the North Queensland city of Townsville: he purchased the $450,000 home in the suburb of Douglas on 3 May 2008. It's believed the home is for his niece, who is studying at James Cook University. Crowe stated in November 2007, shortly after the former husband of his longtime family friend Nicole Kidman, Tom Cruise, had intensified missionary work for Scientology church, that he would like to be baptised as a Christian, and feels that he has put it off for too long. "I do believe there are more important things than what is in the mind of a man," he says. "There is something much bigger that drives us all. I'm willing to take that leap of faith." In the beginning of 2009, Crowe appeared in a series of special edition postage stamps called "Legends of the Screen", featuring Australian actors. He, Geoffrey Rush, Cate Blanchett, and Nicole Kidman each appear twice in the series: once as themselves and once as their Academy Award-winning character. In July 2010 Crowe, who had started nicotine consumption on a regular basis during his elementary schooldays, announced he had quit smoking for the sake of his two sons. By April 2011, it was officially confirmed that his attempt to quit nicotine consumption after 36 years of smoking was not a success and that he has taken up smoking again. In preparation for several film roles in 2012, from June to November 2011 Crowe underwent a gluten-free and non-alcoholic diet and fitness program that consisted of walking, mountain biking and workout in the gym. During this period he lost 24 kg reducing his weight from 114 down to 90 kg . Whole or part of the information contained in this card come from the Wikipedia article "Russell Crowe", licensed under CC-BY-SA full list of contributors here.